For those who have the psychic capability to see spirits, these guardians will appear as a group of four elemental guardians. 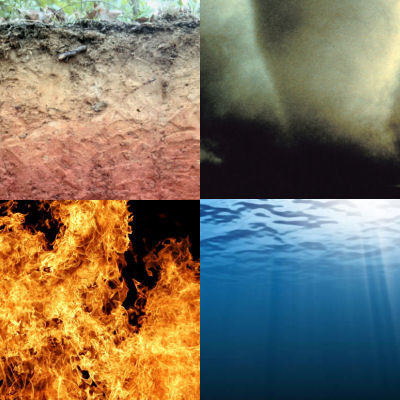 One water elemental (undine), one earth elemental (gnome), one fire elemental (salamander), and one air elemental (sylph). The water elemental will appear as an undine, a black-haired woman with a fish's tail similar to a mermaid. She is loving, kind, and empathetic. The earth elemental will appear as a wizened little gnome. He is serious, stubborn, hard-working, and dedicated. The fire elemental will appear as a salamander, a small, lizard-like being made of flame. He is active, and high-spirited. The air elemental will appear as a sylph, a faerie-like air spirit. She is joyous and playful, and of course, extremely intelligent. In addition to the standard house Guardian capabilities, they will defend any building the stone is placed in from hostile psychic intrusions by those who do not belong and were not invited there by the rightful occupants. They can create a formidable variety of house shields, and also extend their protection to all of the people who are legitimately inside the building, and are affectionate toward them. They have strong ties to elemental energies, and can aid in things associated with those elements, just as wild elemental spirits can. The earth elemental also may help to inspire stability and productivity, and can aid household members in grounding and centering. It knows and can use prosperity-related magicks (drawing wealth, aiding in finding a new job, growing plants or livestock). The air elemental may be able to inspire new ideas. It may help to inspire thought and learning, and can act as an astral guide. It knows and can use travel-related magicks, and may be able to aid in divination and dowsing. The fire elemental may help to inspire positive change, and can cleanse household members' energy systems and environment. It knows magicks related to transitions (leaving something behind or destroying it, to embrace or build something new), sexual attraction, and power. The water elemental may be able to aid in empathy and emotional balance, and induce fear in opponents who are susceptible. It has all of the capabilities of a wild water elemental spirit. It has psychic healing abilities, and knows and can use magicks relating to fertility and healing.